OSHA Silica Dust Regulation: Are You Prepared? In March of 2016 the Occupational Safety and Health Administration (OSHA) announced their final rule to protect American workers and limit their exposure to respirable crystalline silica. These new regulations will affect the Construction Industry as well as General Industry and Maritime. The first silica dust regulation was implemented in 1971 when OSHA was created. Under the old regulations, industries had exposure limits between 100 and 250 micrograms per cubic meter of air over eight hours. The new OSHA regulation limits exposure to 50 micrograms across all industries. Crystalline silica is a natural material that can be found in the earth’s crust, and is present in many building materials including concrete, brick, sand, stone, block, and mortar. Silica dust becomes hazardous when inhaled, which can happen during drilling, cutting, and sawing. Exposure to crystalline silica can result in silicosis, lung cancer, chronic obstructive pulmonary disease, and kidney disease. If you work in an industry where your employees are exposed to sand or dust, including the construction industry, concrete products, foundries, cut stone and stone products, and many others, you may be affected by OSHA’s new rule. In order to be OSHA compliant, there are several requirements you will have to meet before September 23, 2017, when this rule will be enforced. • Reduce the limit for airborne crystalline silica to 50 micrograms per cubic meter, averaged over an 8-hour shift. • Apply engineering controls, such as water or ventilations, or provide respirators to limit employee exposure. • Limit access to high exposure areas in the workplace. • Provide a written exposure control plan, periodic medical check-ups, and adequate training to reduce risk and exposure. • Designate an employee to oversee all OSHA laws that apply to silica exposure, communicate needs, and be the point-of-contact for OSHA. For more details on the OSHA required regulations, visit their website to make sure your company is compliant. With these new regulations in place, the organization expects that over 600 lives will be saved as well as $8 billion in associated costs. For most construction companies, the biggest change will be controlling dust in order to follow these regulations. This can be done through the use of wet saws, vacuums, and proper ventilation. At GSM Industrial we are equipped to help your business “get right” with the new regulation. 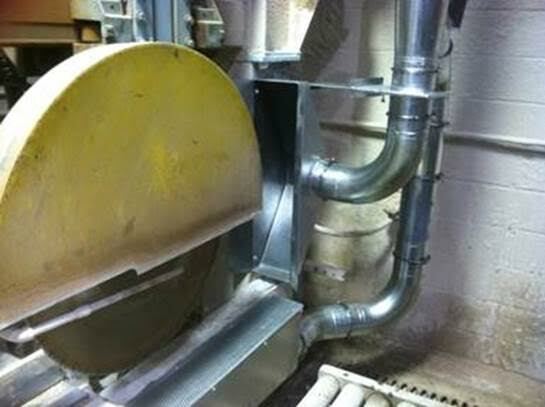 We are able to design, fabricate, and install custom collection systems to help reduce dust and limit exposure to crystalline silica. See below for a capture system we recently completed. By taking the proper steps to protect your employees and remain OSHA compliant, you will ensure your business is safe and successful for years to come. Contact us today to find out how we can help your facility meet the needs of this new regulation before time runs out.